We contacted a few expert users of DLPAL to find out how the programs is performing in this current low volatility environment. All traders may find the results of this survey useful despite methods used because the responses came from quants with skin-in-the-game and who are experienced in developing trading strategies. The current low volatility environment around the world is challenging for quantitative trading models that exploit short-term anomalies in price action since the signal-to-noise ratio has plummeted. A low volatility environment is also especially challenging for machine learning models. For example, the performance of some long/short equity models has deteriorated in this environment due to failure of classifiers to adapt to these conditions. We thought of contacting a few expert customers after a DLPAL user from Thailand, who is also an expert trading system developer, contacted us and asked for suggestions in dealing with low volatility. This customer is a professional trader and his question was about trading strategies developed for the local SET50 futures. Below is a backtest of trading strategy we developed with DLPAL for this futures market using an in-sample of daily data provided by the customer from 2006 to 2015. The out-of-sample equity performance is only shown. We told the customer what risk/reward parameters we use so he may attempt to tune his models for this environment. Below are excerpts from the responses we received. ” PAL is doing reasonably well under the circumstances. At least in my case, the lower volatility has forced me to change my strategies quite a bit. I have had to focus more on directional trades recently and less on long/short portfolios.” A. F. from U.K. This customer adapted strategies to current environment by focusing more on directional trades while avoiding the higher level of noise present in long/short schemes. Note that some details were offered but skipped here. We believe that even if Alex offered more details it would still be difficult for most to replicate what he does. “PAL is still my first choice for developing trading strategies. 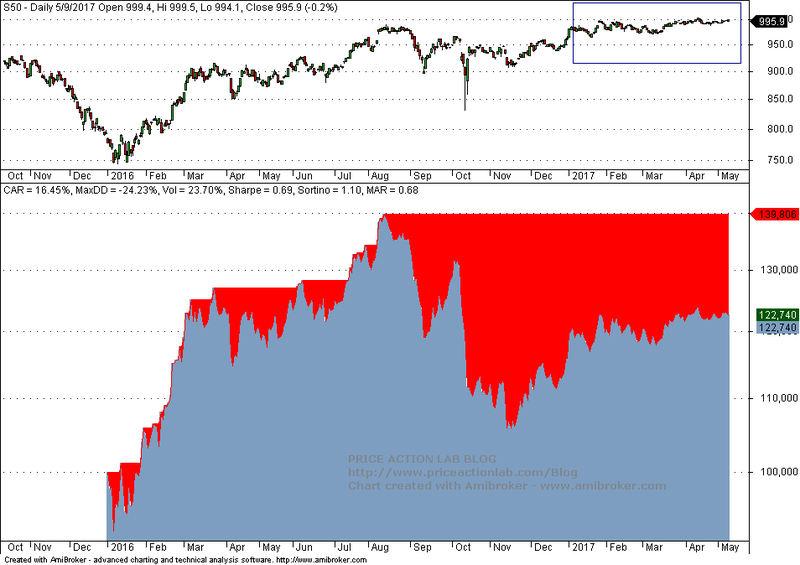 I use several years historical data for backtesting (daily bars) and one year of data for livetrading. If one strategy has negative results in this year I stopped trading with this symbol….I have developed several strategies on stocks. At the moment – I trade only 3 live – the rest gives negative results (but those I trade perform very well) – maybe time for some reoptimizing with the rest.” W. S., from Germany. Adapting to changing market conditions is necessary for maintaining acceptable levels of performance especially during low volatility markets. All our expert users we contacted have already done this or are in process of reevaluating strategies. There are many ways of using DLPAL. One is to develop traditional trading strategies based on parameters-less features, also known as price patterns. Another way that is popular among quants involves using the features generated by p-indicator function to develop machine learning strategies. Another way is used by discretionary quant traders that use the scan function to identify anomalies in data and test their robustness. There are also other ways users have discovered we may or may not be aware of. We provide the tool and a few general ideas but some of our customers usually go beyond that and discover new ways. Anyone who is looking for software that offers to click a button and get a ready-made strategy for any market will not find DLPAL useful and should not consider it. DLPAL is designed for people that like to do the hard work. It is only a tool but the final result is the outcome of the hard work of the user, not an automated result. We believe that the notion that one can develop a program that will generate profitable strategies with a click of the mouse is ludicrous. The markets reward hard work, discipline and skills, not mouse clicks. You can download a demo of DLPAL PRO from this link. For more articles about DLPAL PRO and DLPAl LS click here.